It has been probably the best 3 weeks off together since...well....since I can't even remember. I think the last time we had this sort of time off was back in college..when there were such things as "winter breaks" and "summer vacations". Why did those things ever have to stop? Poo. I guess in all honesty the first week and a half was pretty brutal. But after we hurdled over that, things were pretty fun. Lots of sleeping in, snuggling, morning coffee (or tea) dates, movies, and laughs. Oh and baking. We actually did an exorbitant amount of baking. His idea, not mine. I would never have thought to put something so physically taxing on a recovering surgery patient. But he wanted to, and so we did. Cookies, Pineapple Upside Down Cake, Funfetti Pancakes, you name it- we probably made it. Well maybe not...but you know what I mean- we did a lot of baking. I held a little survey on our Facebook a while back and asked what our fans would like to see us make next (in an edible decoration type of way) and this was by far the number one answer. Shamrocks. 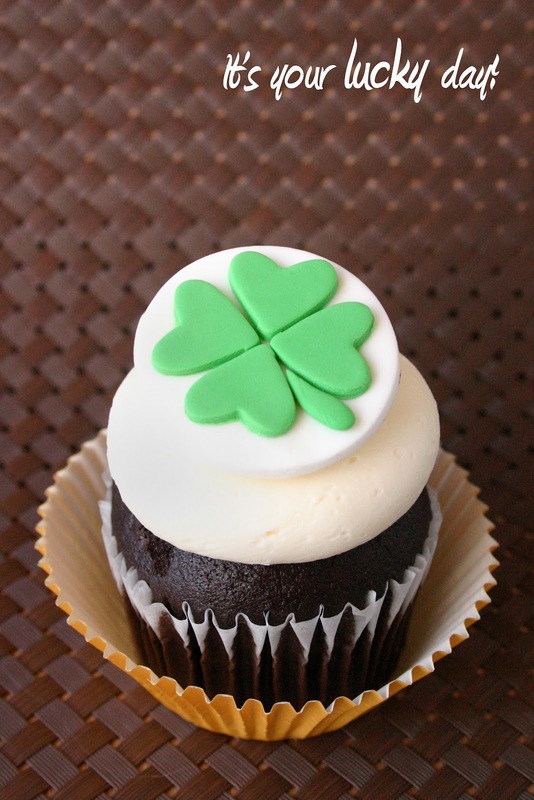 Or Four Leaf Clovers...however you like to say it. So that's just what we did. We started with our yummy gum paste and made 1.75" circles out of it. Next we cut out little green hearts (awww cute!) in the sweetest Saint Patrick's Day green and arranged them to form a lovely little shamrock. Finally, we whipped up a little stem and viola! You have yourself a neat, green, St Patty's Day edible cupcake topper. You can find them here to purchase for your upcoming party! Sorry, I couldn't help myself with that last picture. So how was your weekend? Did you do anything fun and/or exciting? Or was it a total "kick back" type of weekend? Ours was...pretty fun actually. I don't even know if you'd call it a weekend- we've sort of been on a weekend for the last few weeks! Ahh so nice! The other day though, it was so nice outside that we did pack ourselves up a nice little homemade picnic and got outside to enjoy the nice day. Pincnic blanket? Check! Bag of picnic goodies including a super nifty Frisbee? Check! We ended up heading over to a park right down the street from our house. We love this park. It is right on the edge of a cliff (don't worry- heavily blocked off from the actual cliff so there's no falling kiddies!) so on one side all you see is endless ocean, blues, and greens. It also has one of the coolest parts of our town right smack in the center- the Point Fermin Lighthouse. I love this house! It's gorgeous! I actually considered getting married here way back when we were wedding planning...I forget now why that didn't work out. That would have made for excellent pictures! We also had an afternoon with my husband's mom- headed out to Long Beach for lunch and a little thrift store book shopping. The store we went to had millions of books! Some of the weirdest ones we had ever seen. If this was a different type of blog, I'd post some pictures of the really weird ones we couldn't help but take pictures of. Might be inappropriate for this here bloggy though ;) Take my word for it- weird. Then there were the cookbooks....ahhh cookbooks. So many wonderful (and again weird) ones to choose from. My favorites were the old 1960's microwave cookbooks! Microwave! Could you imagine cooking a WHOLE meal in the microwave? I'm not talking freezer dinners either- I mean 3-4 course meals...from scratch...in the darn thing! Ahhh! How far we've come. Anyway, outside the little area we spent the afternoon was this amazing Ferris Wheel. We have yet to ride on it- and it's been here for years! Every time my husband and I head out to Long Beach I say "we should ride that thing"...but we never do. Hmph. Oh yeah...remember those Funfetti Pancakes I spoke of? Haha. Please don't judge me for buying pre-packaged yummies. We couldn't help it! We also did something we had been wanting to do for a long time- have an Ikea date night. Yes...I'm totally serious. We love Ikea. The smells, the fantastic things, the cheap and wonderful foods! Seriously- where else can you get a $0.50 hot dog and $1 soft serve cone? Hmmm??? We weren't in the mood to buy anything particular- we usually just go to browse and get some exercise. Oh and goof off (we love goofing off in the showroom rooms!) Maybe one day I'll tell you the story of when Bill pretended to be a Swedish Chef with his own cooking show in one of the faux kitchens! Anywho, this one item we couldn't pass up. For $5 (YES 5 DOLLARS) we found a neat couch pillowcase cover, which fit perfectly over our old lame couch pillow! Yay for upgrades! Part of the PaperMama Photo Contest! Lastly, we spent our weekend with this lovely lady. She's so lovely. All regal and princess like and stuff. Who wouldn't want to spend some good 'ol time with her? Mombi- we love you. But alas it's Monday... which means we've got quite the bit of days to get through before the next welcomed weekend. I hope this week treats you right- and that you make everyday a fun and stress-free one! So many things that stood out in this blog post so I will list them. 1. 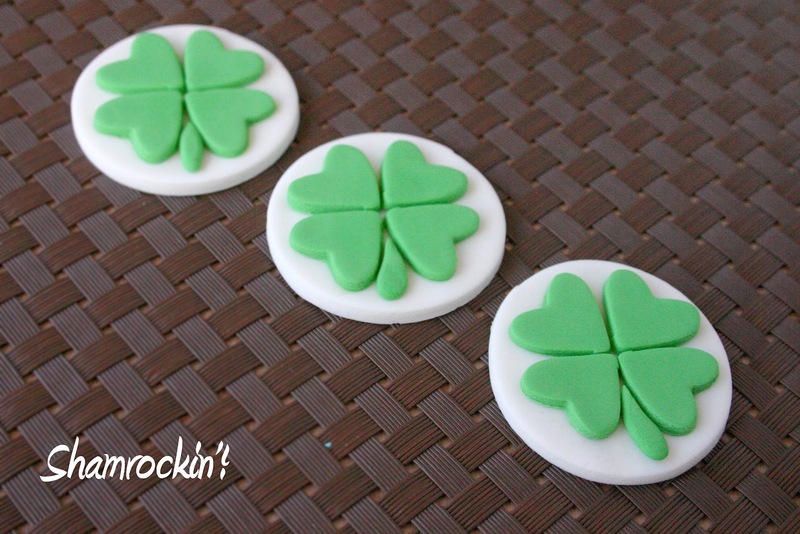 Your Shamrocks are awesome!!! Bring on St. Patty's Day! 2. Beautiful picture of the Ferris Wheel! You could sell that picture! 3. Funfetti Pancakes?!?!? My husband would faint! He loves anything Funfetti! This whole comment made my heart sing! Oh how I love lists! You're speaking my love language! ;) But in all seriousness- thank you so much for the sweet words. You're always so lovely and encouraging...and I just plain appreciate it! RIGHT!?!? ISN'T IKEA THE BEST?!!?!?!? What did I ever do before Ikea!? Gosh.